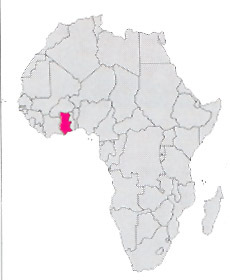 Country of western Africa on the Gulf of Guinea, independent already from 1957, it has a great territory (2/3 of Italy), that develops itself in the inferior basin of the River Volta. The agricultural production has primarily centralized in the cocoa and in the peanuts, but the forests produce appreciated lumber. The subsoil is rich of gold, diamonds and oil, nevertheless the nation is poor and the progress is slow. The education is well developed and the school is obligatory up to 16 years, however the illiteracy remains next to 30%. The populations of the north, the Dagombas and the Konkombas, introduce above all rites and very interesting villages. The Ashantis to Kumasi have a proper king, very powerful and charismatic also to national level and they go famous for their fabrics (the Kentè) and the jewels in gold. Along the Atlantic coast there are historical forts (Patrimony of the humanity) founded from Portuguese, Dutch, English..., sadly famous for the commerce of slaves, among which those of Elmina and of Cape Coast.